For 15 years Kostya’s parents are fighting for him: at first for his life, now for the chance to live a full life. “Our son was born on the 28th week of pregnancy with a weight of just over 1 kg and did not breathe … Then three months in the hospital and many years of treatment to this day. Kostya had two surgeries in Tula, got treatment in Ukraine, St. Petersburg, Lithuania, underwent rehabilitation courses in Brest, Minsk and Baranovichi”. Parents would like to achieve a great results, but sometimes the disease is stronger than they are. Kostya cannot walk, but goes to the ordinary school No. 13 in Baranovichi. He is very fond of Russian and Belarusian literature, chemistry and history. 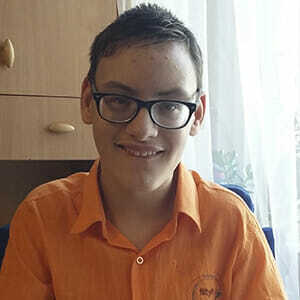 Thanks to the help of the JSC “558th Aircraft Repair Plant” in Baranovichi, there’s now a special stair lift in the the school, and Kostya has the possibility to attend chemistry, physics, history classes with his classmates. But for reasons of safety the boy needs a specialized wheelchair. “For us the cost of such a wheelchair is too high. We will be grateful to everyone who can help our son”.